On March 16, 2019, the County Board approved a request to advertise public hearings for the proposed update to the MTP Bicycle Element. This is a final step before the County Board considers adopting the draft plan. The Bike and Trail Network Map details current bikeways and the proposed bicycle network under the draft Bicycle Element update. The current Master Transportation Plan Bicycle Element was adopted in July 2008. While many of the goals and policies of the plan remain relevant, there have been significant changes in technologies, facilities and best practices that warrant a comprehensive update of the plan. The plan update will incorporate input from people with a wide range of abilities and backgrounds from civic and business organizations. Input from the public will be sought at various times throughout the plan’s development. Time for public comment will be incorporated into all working group meetings. County staff and working group members have been out in the community gathering input since early 2017. Through the first two phases of community engagement County staff were able to gather approximately 2,000 comments through online and in-person engagement activities. Community input influenced every aspect of the draft update, and involved a three-phase engagement process. Engagement during phase one began during the summer/fall 2017 and focused on gathering input for the development of the plan’s overall goals and policies. Outreach included pop-up events at various locations across the County including Metrorail stations and farmers markets. The second phase of community engagement began in the spring of 2018. Engagement activities focused on gathering community input as to where bicycle facilities are needed, what types of facilities are most desired and how to prioritize the planned bikeway network improvements. Staff and working group members were in the community at pop-ups at farmers markets and events like Bike to Work Day. Two public workshops were held in June 2018 at Arlington Mill Community Center and the Navy League Building. County staff and working group members reviewed results of the two survey exercises when developing the updated Bicycle Element plan. Between May 24 and June 29, 2018, a second comment form was posted online and was available at community events. This form asked for feedback on where bicycle improvements are needed and what types of bike facilities residents want to see. Data analysis of feedback provided at the community events and online can be found below in the Working Group Meeting 12 materials. Through January County staff have been out in the community seeking input on the draft proposal. 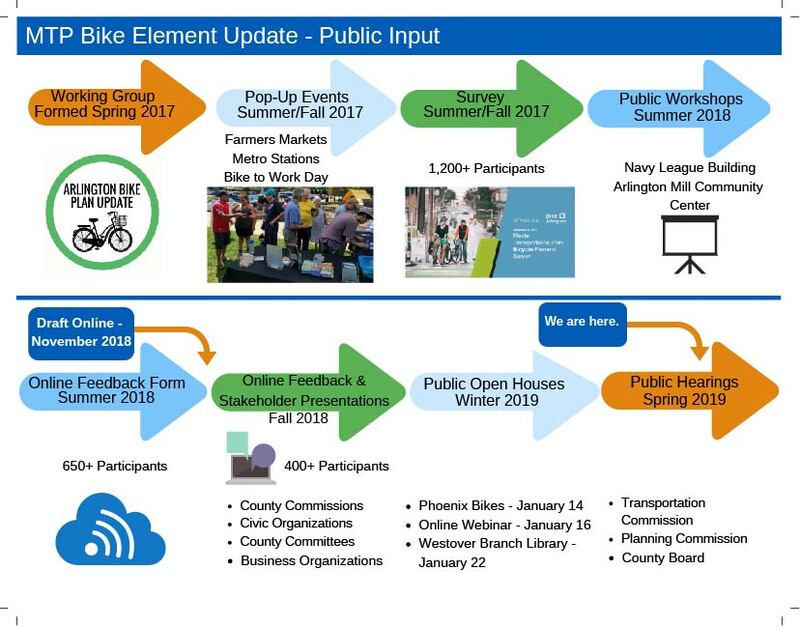 In addition to presenting to approximately 14 stakeholder groups and organizations, County staff organized two open houses one on January 22, 2019 at the Westover Branch Library and another held on January 28, 209 in partnership with Phoenix Bikes. The open houses were attended by approximately 120 residents. Additionally members of the community could also participate in an online feedback form which received input from over 650 respondents as well as an online webinar which is currently available online. A summary of engagement will be available online in the coming weeks including public comments and general themes. Interested stakeholders can now view a Summary of Public Comment on Phase III community engagement online. Having a working group made up of community members allows staff to involve, and work directly with, the public throughout the process to ensure public concerns and aspirations are consistently understood, considered and reflected in the recommended plan update. The working group will generally meet on a monthly basis for approximately 10-15 months. Other meetings may be added to meet target deadlines or for community engagement activities.